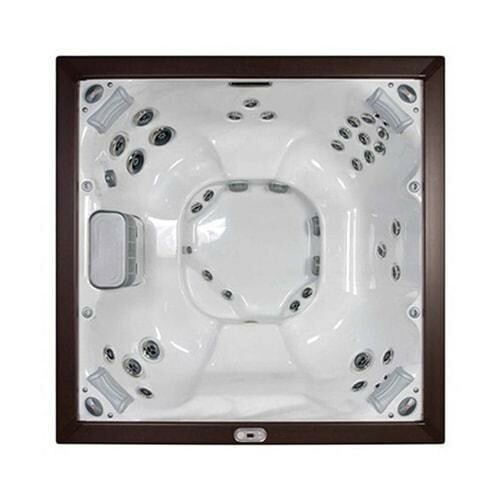 The Jacuzzi® J-LX® hot tub combines comfort and modern style for six to seven adults while minimizing energy costs. Not only is the J-LX® one of the most energy efficient hot tubs in its class, it’s also leading the way in hot tub styling and design. The J-LX® seats six adults and is standard equipped with powerful jets, LED lighting, a streamlined control panel system and tasteful stainless steel corner accents. The stand-alone styling of the J-LX® hot tub is perfect for a cottage or backyard deck, featuring Jacuzzi®'s new weather-resistant cabinetry shells which come in either Brazilian Teak or Roasted Chestnut finishes. The innovative design of this Jacuzzi® hot tub means improved hydrotherapy, more massage flexibility, and overall, less tension and stress in the lives of those who enjoy it. Top-of-the-line PowerPro® Jets, including four bold RX Jets, combine performance with comfortable seating without compromising hydromassage power. 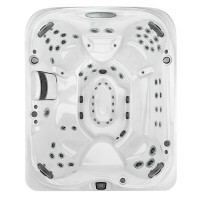 10 Years Shell Structure: Jacuzzi® spas are warranted against water loss due to defects in the spa shell for up to ten years from the original date of purchase. 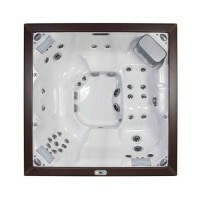 7 Years Shell Surface: Jacuzzi spas are warranted against blistering, cracking, or delaminating of the interior surface of the spa shell for seven years from the original date of purchase. 5 Years Plumbing Components: Plumbing components are warranted against leaks due to defects in workmanship or materials for five years from the original date of purchase. 5 Years Equipment and Controls: Jacuzzi® spas’ electrical equipment components (specifically limited to pumps, heater, and control system) are warranted against malfunctions due to defects in workmanship or materials for five years from the original date of purchase. 5 Years Cabinetry: Jacuzzi® spas’ ProEndure™ synthetic cabinets are warranted against defects in workmanship or materials for five years from the original date of purchase. Normal wear and weathering of the finish will occur naturally over time, and are not defects. A combination of rejuvenating, spiral streams of air and water and large, wide-swath rotational action stimulates muscle groups to help overworked muscles. Unique rifling action sends spiral streams of air and water to strategic muscle groups to rejuvenate back muscles while directional jets relieve tension in hard-to-reach neck area. The J-LX® Collection offers a premium hydromassage without reduced jet power. Explore more features here. The J-LX® Collection combines high performance hot tub technology with the latest innovations in energy efficiency. Featuring a streamlined and intuitive control panel for ease of use. Patented flat surface deck profile for a minimalist look while eliminating exposed acrylic for energy efficiency. Maintain the performance, reliability, and ease of use of your hot tub with Jacuzzi® Genuine Parts and Accessories. Prolong the enjoyment of your hot tub with accessories and chemicals. Please provide your information in the form below to get the quote.